Rating: Fairly easy family-friendly hike with minimal scrambling. Access: Sand Beach parking lot, Great Head parking lot. Length: Roughly 2 miles for the complete loop. 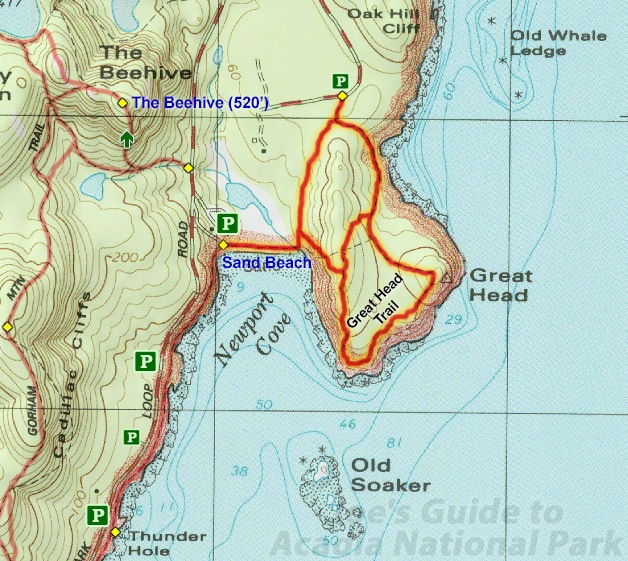 Elevation Change: 150-foot elevation gain from Sand Beach to Great Head. 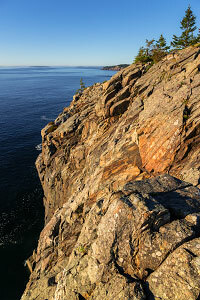 The start of the hike involves a short bit of scrambling as the Great Head Trail makes its way up the initial cliffs. Once on top of the formations, the trail levels out and loops around the coastline of the peninsula. Similar to Ocean Path, there are many spots where you can leave the trail for a bit to explore or relax on the rock formations. At the easternmost part of the trail is the highpoint of Great Head, where the tall cliffs offer amazing views of the ocean below. (This is a popular spot for climbers who want to experience the ocean pounding just beneath them.) WARNING: While it is exciting to explore the area, keep young children away from the edges as there are many exposed downward slabs. Continuing along the trail, you soon hit a junction where you can choose the shortcut trail back to Sand Beach or the longer loop that continues up the coastline. The longer loop offers a few more spots where you can leave the trail and enjoy random exploration of the rugged coastline. The final stretch of trail follows an old dirt road south back to Sand Beach. 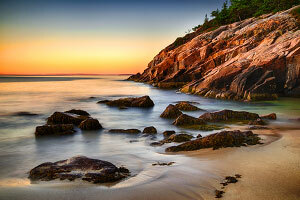 The loop hike around Great Head is a great little diversion from a day of lounging at Sand Beach. The trail is mostly easy and family-friendly, although the initial scramble up takes a bit of effort. And please take care with children exploring the tall and exposed cliffs around the Great Head highpoint.